PCI Express 2.0 ×4 Card capable of capturing VGA, DVI, HDMI, 3G-SDI, HD-SDI, and SD-SDI audio/video sources. 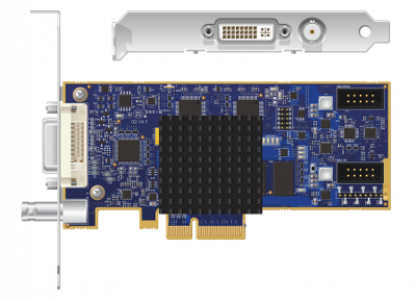 Epiphan’s highest performance dual input PCIe capture card, capable of capturing VGA, DVI, HDMI, 3G-SDI, HD-SDI, and SD-SDI audio/video sources. DVI2PCIe Duo provides uncompressed dual channel video to third party recording, streaming, conferencing and video analysis software applications running on Windows, Mac OS, or Linux platforms. DVI2PCIe Duo supports DVI resolutions up to 2048x2048 and captures digital audio from HDMI and SDI sources. The low profile card is perfect for 2U cases. An alternative bracket is included for use in full-height cases. An optional A/V Kit adds support for S-Video and audio from 3.5mm stereo or unbalanced ¼" TRS audio inputs.